Well, actually it happened in January. Yeah, I know...I'm late off the mark, but I am still incredibly honored to be asked to participate in a documentary about one of my all time FAVORITE ARTISTS: Brenan Sharp. Well, lately I've been thinking a lot about art and the spaces we create in ourselves and our homes for creative expression. The past few years, my painting took a back seat to my writing. A recent trip to Mexico City stirred my painter brain from its dormant state. The vibrant colors of Mexican muralists combined with a swing by Frida Kahlo's Blue House made me want to pick up my brushes, again. In the past, I would pace myself worried that too many canvases would collect in my limited apartment space. But now with sites like Etsy and Vango combined with Paypal and Square, I feel like I have a means to transact business and actually (hopefully) sell a few pieces.There are folks who would say, "But you should create art for art's sake!!" I hear you, but the engineer in me is too much of a pragmatist. I am a maker who needs to make things to be sane. I am also a sales woman who knows the value of her time and work. This point was hit home by my new financial planner. They were impressed by the variety of talents that I possess. In a nutshell, I felt supremely convicted when they said, "You need to find ways to monetize your skills." That statement has stuck with me. My dear artist friend, Brenan, has found a way to balance his award winning graphics design day job with his award winning painting career. 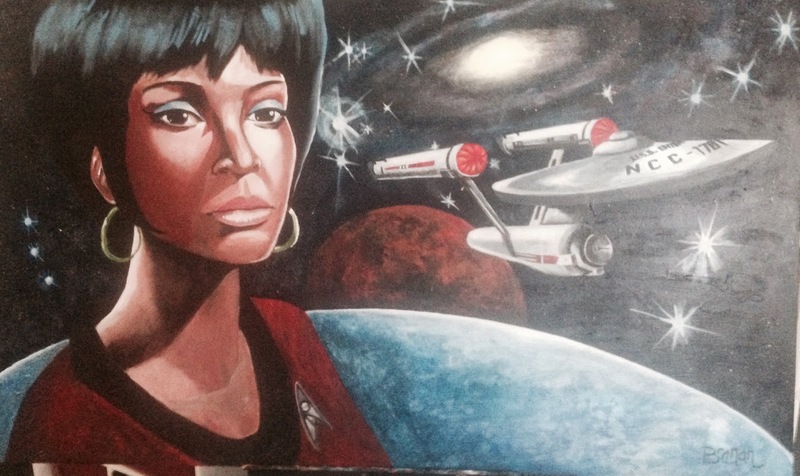 (I now own three of his works including the Uhura commission below.) I need to find that same sort of balance, too. A card carrying member of the Nerdcore, I learned about SΔMMUS through Black Girl Nerds and For Harriet. I fell in love with her album Another M that mixes fun, thought provoking lyrics with soundtrack cuts from the video game series Metroid. Although I enjoy the entire album, Power-Ups and Mae Jemison are my two faves that consistently make my inner geek girl squeal with glee. Underground rapper, Cornell graduate, PhD student - that's SΔMMUS in one fierce nutshell. Check her out - for real! Oops my power level broke your scouter...."